Yezda Scarf Knitting Pattern. The pattern will be available soon. 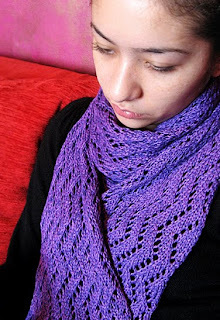 İt is a lace scarf knitting pattern. The stitch pattern is pretty easy to remember, it requires just yo (yarn overs) and ssk or skp and k2tog. Looks very different...is it done with the knitting sticks?Looks like a crocheted scarf.very neat work.